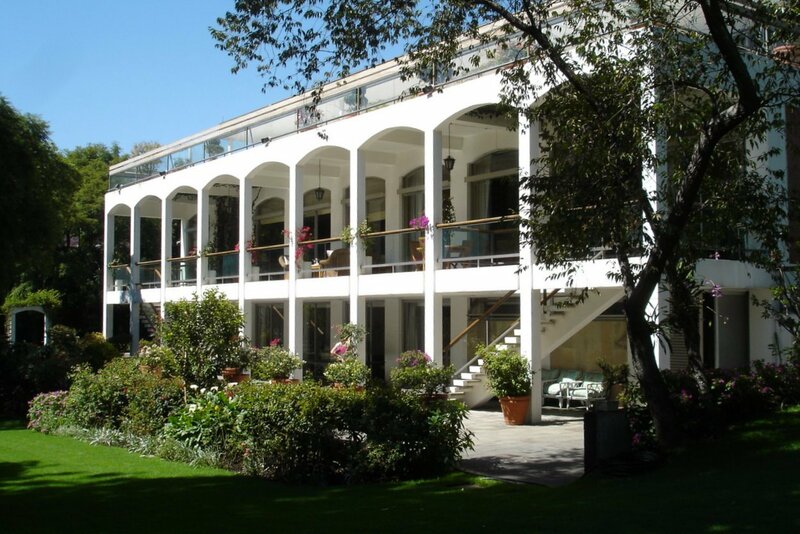 There was a British legation in Mexico City from 1835, and consuls-general from before then. 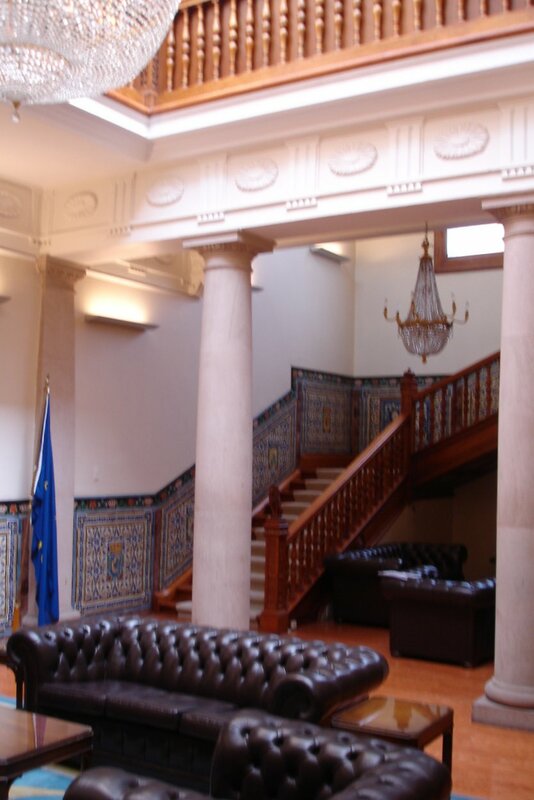 The legation became an embassy in 1944. In 1907, the minister, Reginald Tower, advanced three reasons to the Foreign Office for buying a site and building a legation: he was frequently having to move because his rent allowance was inadequate; Mexico was becoming a more prominent country; and a new legation would give pleasure to the Mexican government and the British colony in Mexico. None of these reasons was perceived in London as a strong argument for a new building. Tower was nevertheless in touch with a syndicate called the United States and Mexican Trust Company which had acquired a large piece of land which it called the Cuauhtemoc Colony ‘in the most advantageous and healthful quarter of the capital’. The syndicate had already invested in the Colony’s infrastructure and was now selling plots for development. Should London agree to buy one, Tower recommended commissioning Charles Grove Johnson, a respected local English architect, to do the design. Both the Office of Works and the Treasury again said no. Tower was persistent. 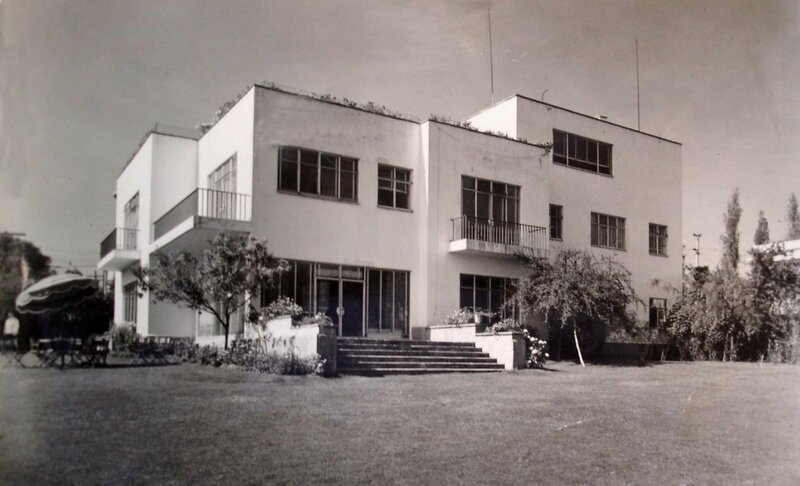 While on leave in London in 1909, he brought to a meeting with the Office of Works a merchant called John Benjamin Body, who had a site to sell in the Cuauhtemoc Colony and was the representative in Mexico of Messrs S. Pearson and Son, a huge British firm. 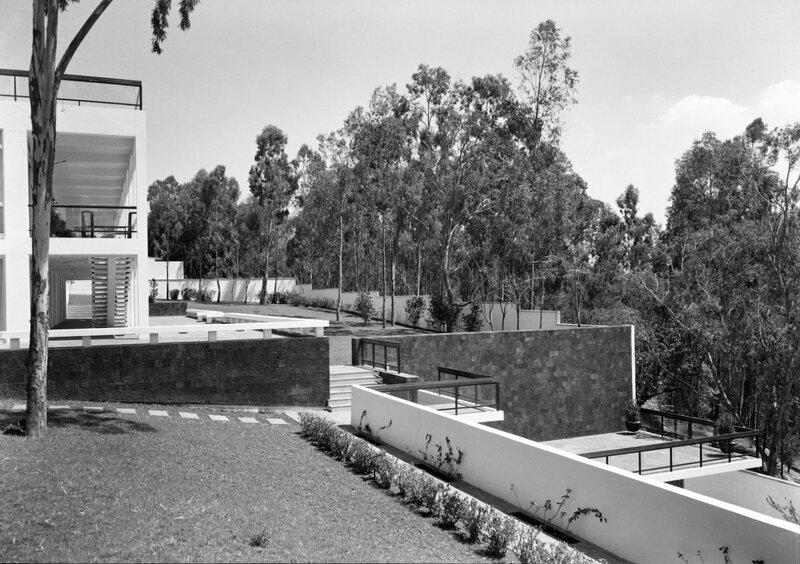 He also brought Charles Grove Johnson, his preferred architect and one of very few reliable contractors in Mexico City. The Office of Works reluctantly accepted Tower’s arguments, and managed to obtain Treasury approval to the purchase in autumn 1909. Body would not accept anything less than £3 per square metre but was prepared to wait until the next, 1910/11, financial year for his money. The site comprised 2,582 square metres in three lots at the corner of what was then called Avenida Reforma 1 and Calle Reforma 10 Norte (now Rio Lerma and Rio Sena respectively). The freehold purchase was duly completed in 1910 for £7,746. Thrift Reavell, an experienced Office of Works architect, produced an outline design for the house along normal Office of Works lines for Johnson to develop. The Secretary, however, later ruled that Johnson should have a clean slate as the architect. His designs, over-influenced by Tower, predictably turned out to be much too elaborate and expensive. 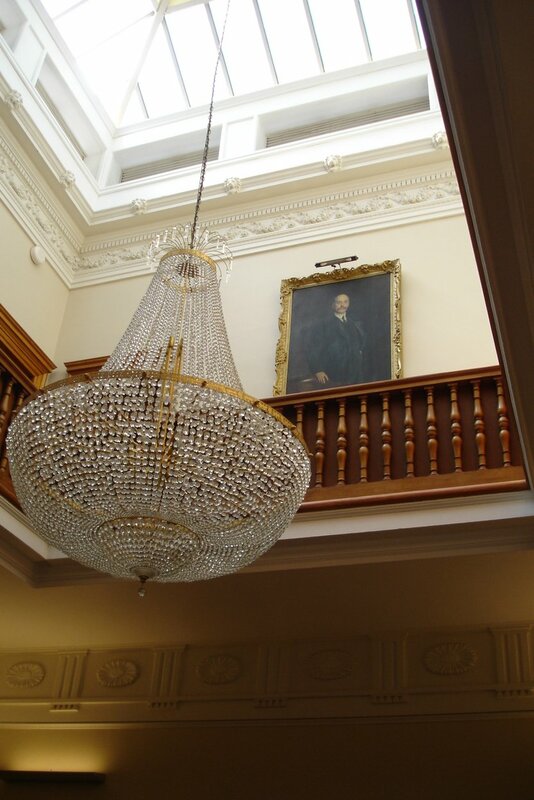 The Secretary complained that ‘they have produced a plan of a house, fitted for a first-class European Embassy, with splendid Reception Rooms, and a lavish and most expensive ornament such as Mexican onyx.’ The cost, including the site and furnishings, was estimated at £35,000, whereas the Office of Works was confident that a perfectly suitable house could be built for £22,000. The Office of Works sent H.N. Hawks, one of its senior architects, to Mexico to liaise with Tower and Johnson and come up with an acceptable design at affordable cost. He produced a good plan, which Pearson built for about £16,500, and Tower’s successor took up occupation in 1914. 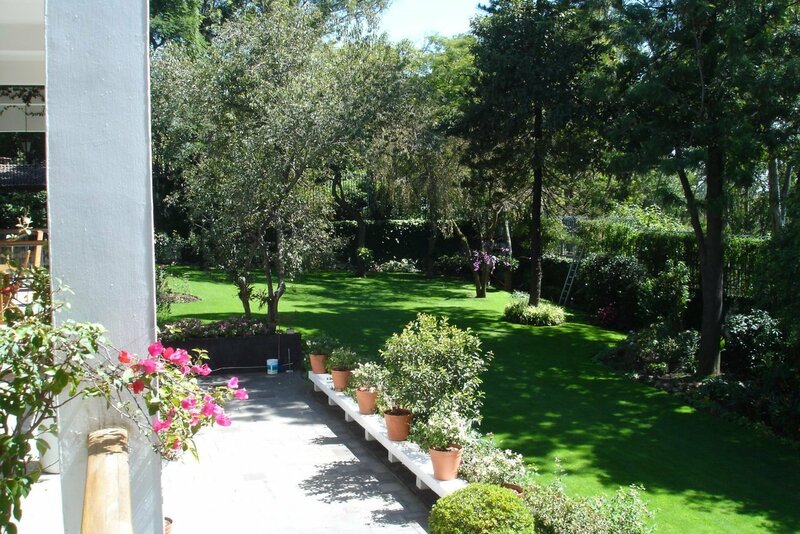 It was the first purpose-built legation in Mexico City, and was liked by its occupants from the outset. 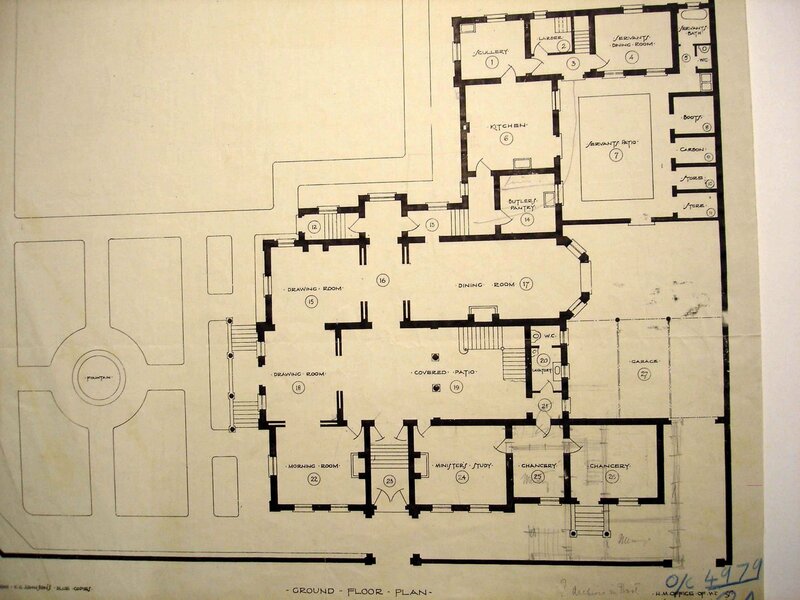 Ground floor plan, with separate chancery entrance at bottom right, 1911. First floor landing around central hall, 2006. 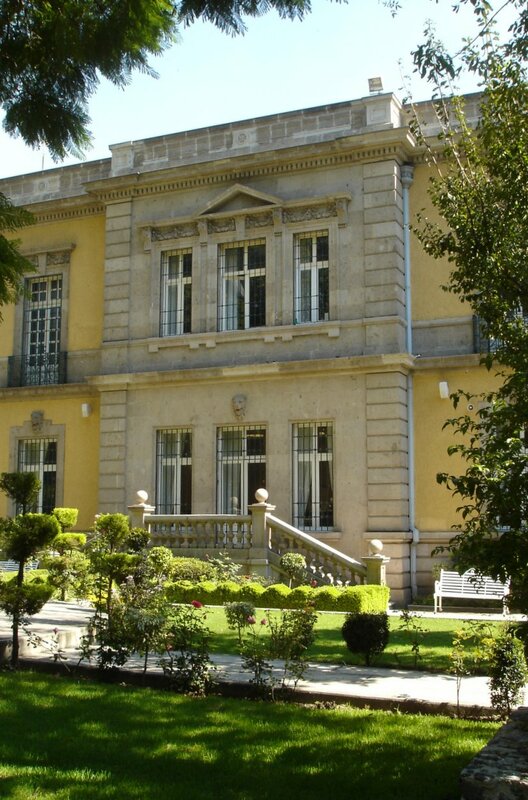 The first ambassador unable to reside in the Cuauhtemoc Colony, John Taylor, went first into a furnished rented house and then, in 1951, to a house at 1145 Boulevard de los Virreyes, leased from Mrs Maria Teresa G de Diaz. 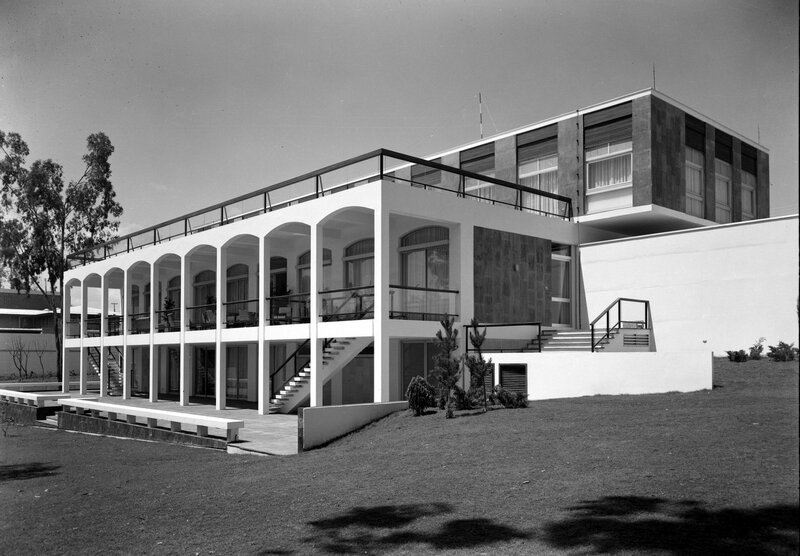 The debate about building a new residence started at the end of 1958. About twenty sites were considered during a Ministry of Public Building and Works visit in March 1959 but few held promise. The Treasury agreed that one of them, 1560 (later re-numbered 1548) Virreyes Road, could be bought within a limit of £50,000. It was about 1 acre, part of the former Rancho de Coscoacoaco, and lay above the general level of pollution in a good residential area. The site was steeply sloping and, at the time, wooded and with cheap old low buildings on it: also, apparently, caves beneath. It was bought from Senora Ofelia Padron de Pineda for £46,000 in late 1959. There were the usual tussles about how large the new residence should be. The Ministry thought that it should dine 26 and receive 200 to 250 for cocktails. 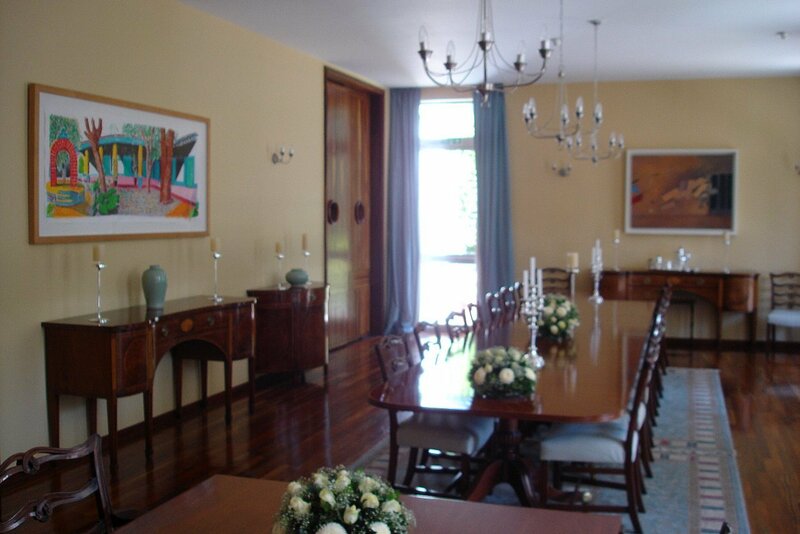 The Foreign Office contended that it should dine 30 comfortably and reception space should be arranged to take 400. The Treasury compromised and said dine 24-30 and receive 200-250. There was a concurrent tussle for a swimming pool, which the Treasury eventually approved. 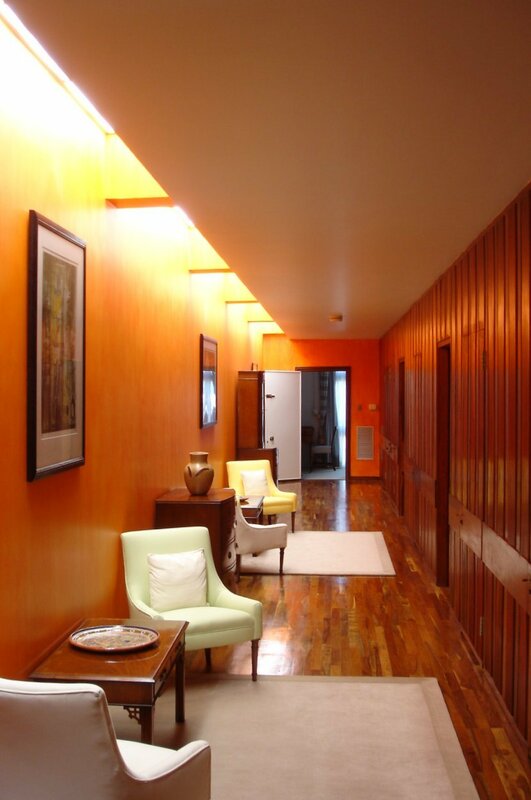 Eric Bedford, the Ministry’s chief architect, played an unusually detailed part in the design of the residence, assisted by John Kaye, a senior Ministry architect. The slope of the site permitted floors both above (bedrooms) and below (private quarter) the main rooms on the entrance level. A circular stair, with a lift up its middle, connected the three floors. 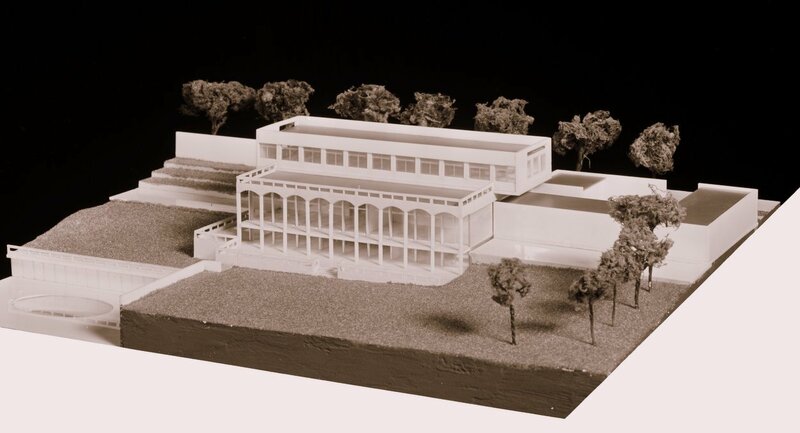 Bedford showed the model and drawings to the Minister in June 1962: he gave his approval and conveniently agreed that there was no need to show the scheme to the Royal Fine Art Commission. All the drawings were done in-house although there was a shortage of staff in the drawing office. The building was initially estimated at £60,000, which had risen to £127,000 at the end of the working drawings stage. Treasury approval was granted in the sum of £132,000 in January 1964. 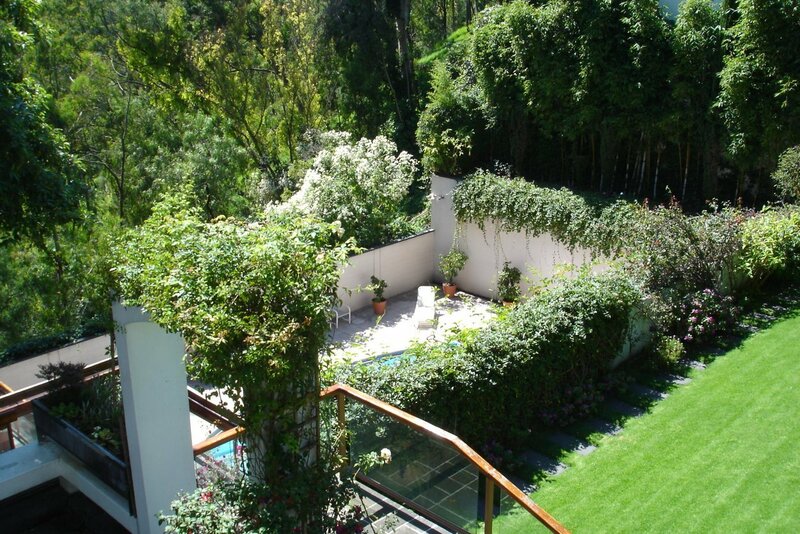 The tenders came in high and, after a quantity surveyor’s visit, the contract was let to Constructora Franser SA. A. McMillan was the clerk of works. 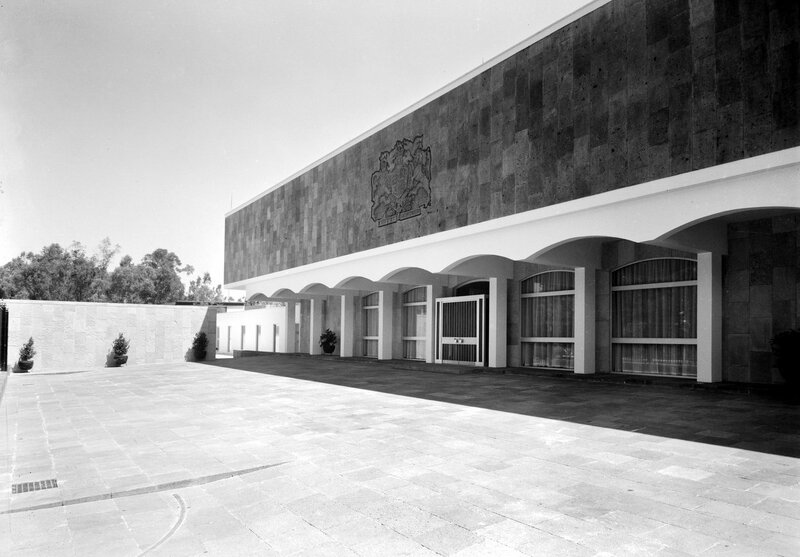 The contract was completed in late 1965 and the ambassador moved in in March 1966. The final cost was very nearly £200,000. It remains a rather clumsily articulated building, but is heavily clothed now in planting and landscape. 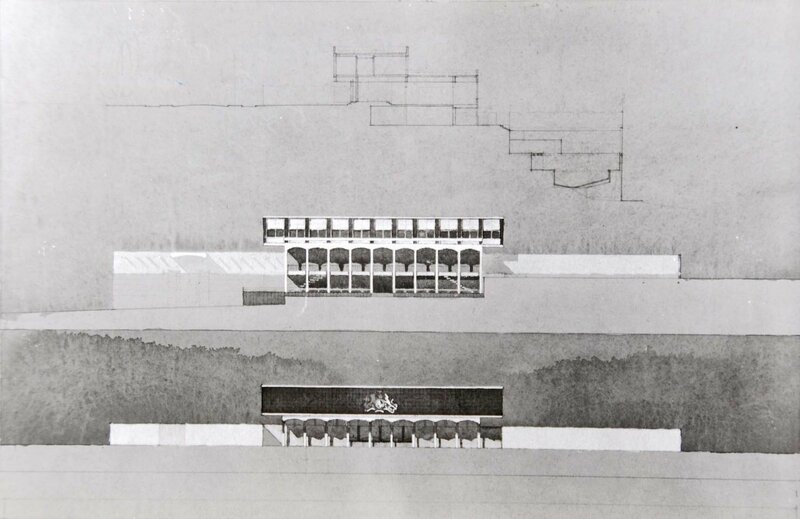 Drawing by Eric Bedford (by courtesy of Ann Snow) of section and elevations of proposal, 1963. 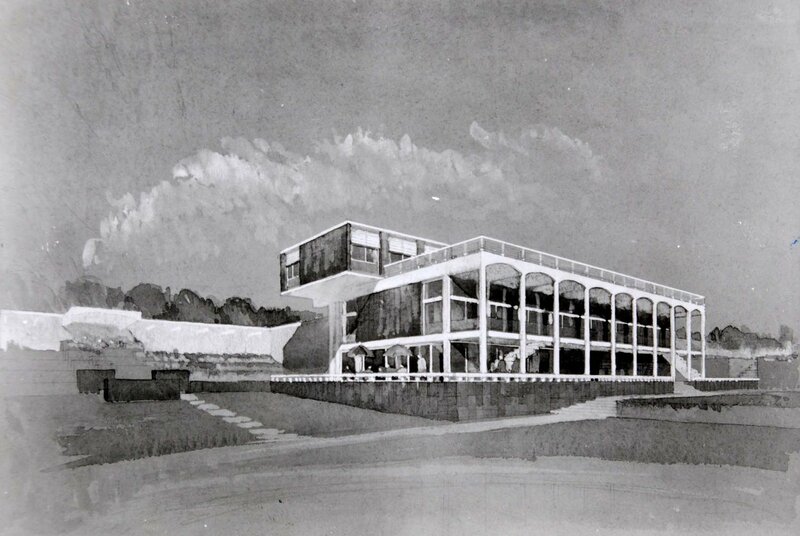 Perspective sketch of proposal by Eric Bedford (by courtesy of Ann Snow), 1963. 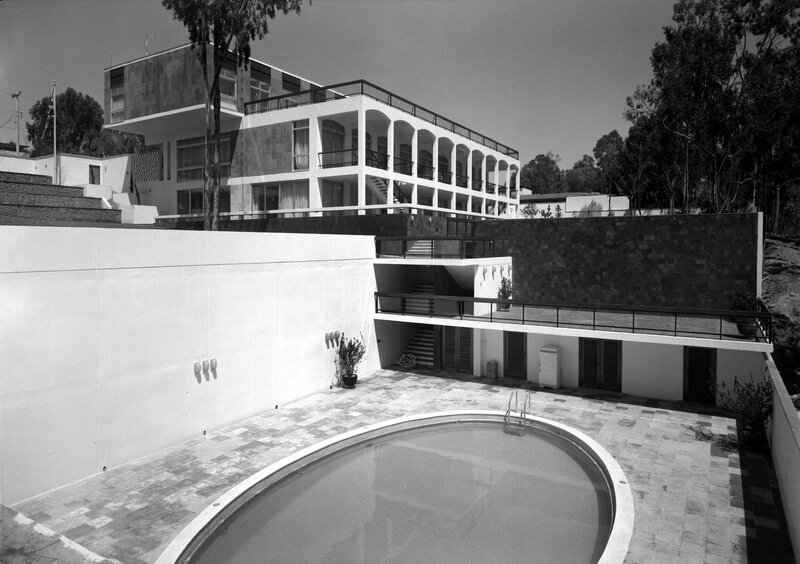 View up from pool, 1966. View down to pool, 2006.